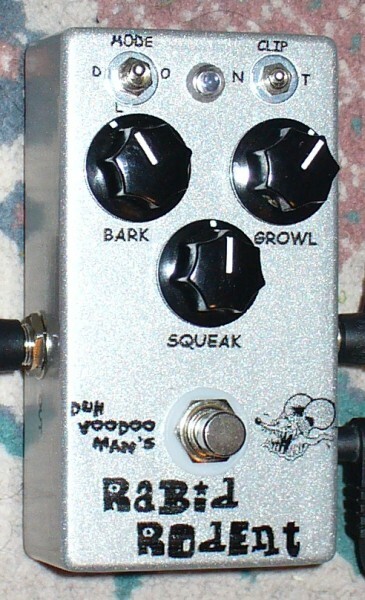 As you might infer from the name, the "Rabid Rodent" is a juiced-up clone of the old ProCo Rat distortion pedal. If you're looking for more distortion than an overdrive pedal will give you, but not quite as much as the typical fuzz box, this pedal may be right up your alley. 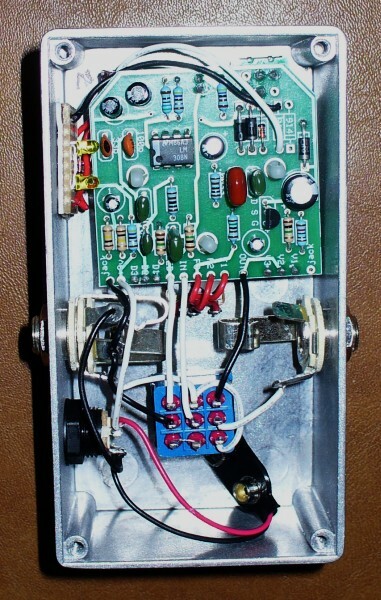 Built from BYOC's Mighty Mouse kit, I added just one additional modification to this already full-featured distortion box. Not content merely to offer a direct clone of the Rat, Keith at BYOC designed the Mighty Mouse to offer three operational modes--the "vintage" Rat distortion mode, a diode-lift boost mode, and an overdrive mode, where an asymmetric silicon diode clipping section has been inserted into the opamp feedback loop, the way a Tube Screamer and many other OD pedals work. An on-off-on 3-way DPDT toggle switch lets you select between the three modes. Controls include the usual volume (Bark), gain (Growl) and tone (Squeak) pots. My only addition was to move the distortion clipping section off the main PCB onto a small piece of perfboard with an on-on SPDT toggle in between. This allows switching between two different pairs of clipping diodes--a "normal" pair of 1N914 silicon diodes or a "turbo" setting that uses a pair of 3mm yellow LED's. So, between the three operating modes and the two different distortion clipping options, this pedal is one flexible little tone box. And cranking the gain up gives gobs of sustain!